1 of 1 Cut chicken thighs into 1-inch pieces. Place in resealable plastic bag; add lime juice, sugar and garlic. Press to combine. Refrigerate at least 2 hours. 1 of 3 Smash garlic cloves and place in a food processor; blend until minced. Add sage leaves and roasted pepper; process until smooth. Add mayonnaise, sugar, lime juice, salt and pepper and process until smooth. Remove to a bowl; cover with plastic and refrigerate until ready to serve. 2 of 3 Soak 24, 6-inch bamboo skewers in water for 30 minutes. Heat gas grill to medium-high or prepare charcoal grill with medium-hot coals. Cut pepper into 1-inch pieces. Thread a pepper piece onto skewer. Wrap chicken in a sage leaf and thread onto skewer. Repeat using all ingredients, for a total of 24 kebabs. 3 of 3 Grill about 12 minutes, turning often, until chicken is nicely crisped. 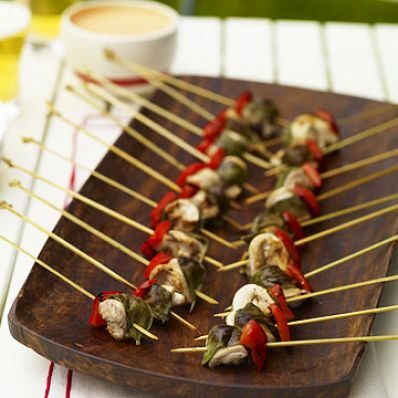 Remove and serve with pepper dip; kebabs can be served at room temperature.